When looking at this year’s XBLA Summer of Arcade line-up, it would have been easy to peg Tequila Works’ Deadlight as a promising outlier. It’s minimalist aesthetic reminds vaguely of Limbo, and its deliberate but smooth platforming challenges seem ripped from Out Of This World. In reality, though, this side-scrolling survival horror game is a mess, where involving and excellent aspects blend with bafflingly poor design decisions. You play as Randall Wayne, a man with one motivation; he must find his friends and family. The apocalypse has, well, happened, and the once lively streets of Seattle are now littered with “shadows.” These shadows are, for all meaningful classification, zombies. But Randall isn’t an action hero, and an encounter with three or more zombies at once will almost surely lead to death. With this weakness in mind, you must trudge through the ravaged city with little more than a fire axe and a six-shooter. 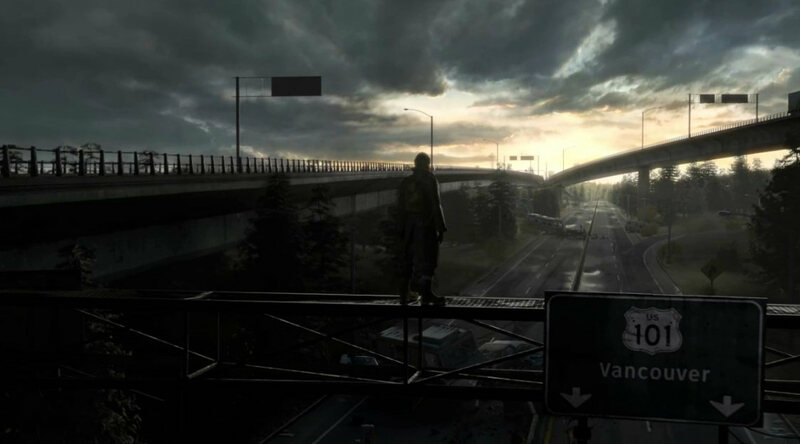 The concept is familiar but promising, but Deadlight fails to inspire any real feeling of helplessness or dread. This is in large part due to its frequent checkpoint system and lack of a death penalty. Even if I do get swamped by zombies, I’ll simply die and restart seconds before that happened, with full health. I can’t say that this wasn’t a smart design decision, but it seems contrary to one of the game’s prime directives. Why should I feel scared when there’re no consequences? Another main weak point comes when you want to defend yourself. Combat with the axe is sluggish and imprecise. When you’re overrun by enemies, it’s not because you lacked skill; it’s because the zombies lined up in a row and hit you at various intervals, triggering a “tab the B button” quick-time event and never giving you time to catch your breath. The focus on animation is more than welcome during the game’s smartly designed platforming segments, but during combat it frustrates. When I say that Deadlight‘s platforming is ripped from Out Of This World, I’m being quite literal. There’s an incredible, satisfying weight behind Randall’s movement that makes jumping from ledge to ledge a joy. The striking art style generally compliments this navigation, as subtle visual clues are placed to steer you in the right direction. In the first and third of the three acts, these segments were broadly quite fun. Which is to say that in the second act, everything falls apart. Suddenly, the zombies are no real threat, and the game struggles to introduce other, more devious enemies to little success. An extended sequence that takes place in a sewer is easily the worst of the game, where the muted industrial setting makes it hard to determine what’s a platform and what isn’t. When you combine that with constant one-hit kills, and a perilously aggravating auto-scrolling sequence, it becomes simply too tedious to bear. It also doesn’t help that the story’s main twist is so easy to predict, and that the voice acting is so uniformly terrible. I don’t want to give the impression that I’m entirely down on the game. It has style to spare, and a unique breed of puzzle/action/platforming gameplay that recalls some of my favorite games on the SNES. If you, too, have an affection for games like Flashback and Out Of This World, then I suspect you’ll find a lot to love in Deadlight. If you’re expecting a consistently engaging game in both story and gameplay, there are better ways to spend fifteen dollars, especially on XBLA.